The NOvA project recently had a big breakthrough when the detector revealed the first evidence of oscillating neutrinos. Finding neutrinos is difficult enough, but without Open Science Grid computing muscle, the experiment would have been virtually impossible. Understanding neutrinos may help unlock the building blocks of the universe. An international collaboration has revealed how neutrinos change over a great distance. The computing power needed for such experiments is immense. The Open Science Grid is up to the computing challenge. For one of the most abundant known particles in the universe, neutrinos are poorly understood. To fill in the blanks, the NOvA (NuMI Off-Axis νe Appearance) neutrino detector is helping us discover what causes neutrinos to transform from one form to another, which will ultimately bring us closer to understanding the elementary particles of the universe. A $278-million international collaboration of nearly 210 scientists and engineers from 39 universities, laboratories, and other institutions, the NOvA project recently had their first big breakthrough when the detector revealed the first evidence of oscillating neutrinos. 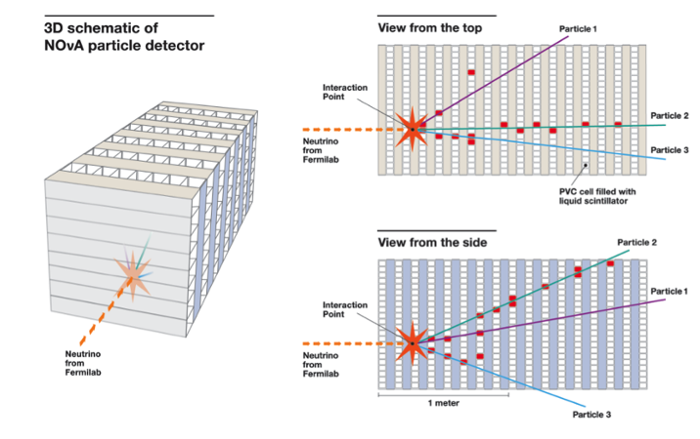 NOvA detects neutrinos beamed from Fermi National Accelerator Laboratory’s NuMI (Neutrinos at the Main Injector) near Batavia, Illinois, to the 14,000-ton, multi-story detector located over 500 miles away in a remote area near Ash River, Minnesota. An underground near detector first measures the neutrino composition as it leaves. The neutrinos then pass through matter as though it doesn’t exist. As Himmel explains it, neutrinos come in three forms: muon neutrinos, electron neutrinos, and tau neutrinos. Since very few muon neutrinos become electron neutrinos, and neutrinos interact very rarely, sifting through the haystack of neutrino particles is challenging. How rare are these sightings? In their first run, Himmel's team only saw six. The team's primary goal is to study the nature of how matter causes neutrinos to change forms. They are looking at differences in how neutrinos and anti-neutrinos travel through the Earth, and trying to understand the differences in mass. “Two neutrinos are close in mass and the third is very different, but we don't know whether it is heavier or lighter—we just know that they are different,” says Himmel. The only way to isolate the electron neutrino signature from background cosmic rays is through computationally intensive techniques. Cosmic rays come through the far detector at about 100,000 every second — almost 8 billion every day. “Since we typically have 50 cosmic rays close in time (&lt;0.55 ms) to every neutrino we see, we need serious computing power to search through them for the neutrinos!” Himmel says. Accelerating discovery. Neutrinos are a mystery to physicists. They exist in three different flavors and mass states and may be able to give hints about the origins of the matter-dominated universe. Led by Fermilab a new long-baseline experiment called NOvA may provide some answers. Courtesy Fermilab. Read the full conversation with Himmel here. 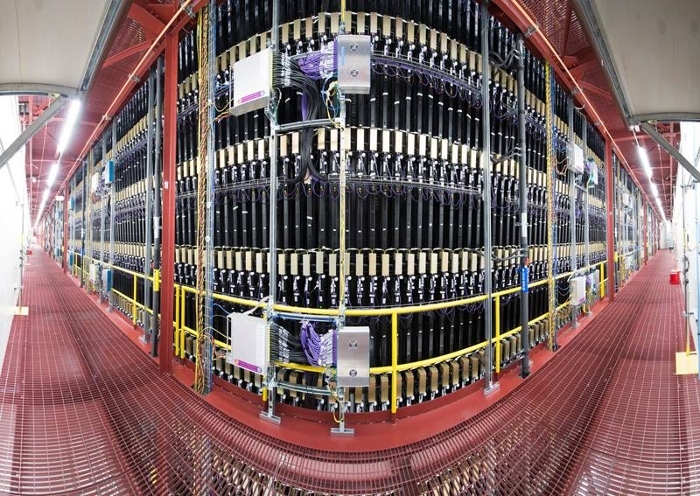 Read our previous report about Fermi’s world record for high-energy neutrino experiments: a sustained 521-kilowatt beam generated by the Main Injector particle accelerator.